Cryptocoins have been quite controversial since the very beginning, and they remain so. Even as Bitcoin, Ripple, Verge, and Ethereum have soared in value over the last few months (the market is down again for the last couple of days, though), there are still plenty of detractors and skeptics who attack the currencies at every chance. But there’s the other camp. Some really influential people in the digital world have become champions for cryptocurrencies and the blockchain technology. 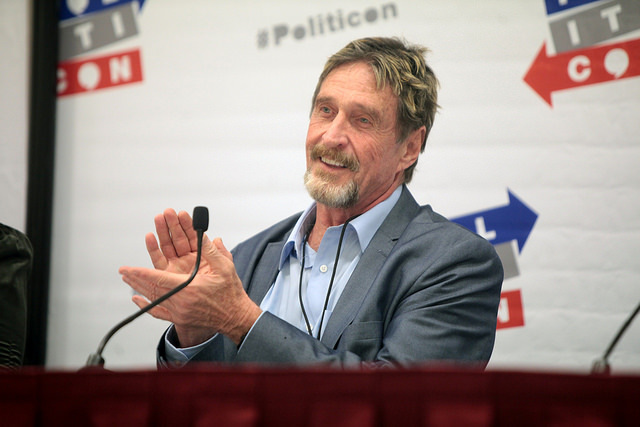 Most famous among them is probably John McAfee, the eccentric computer programmer, and entrepreneur who founded the first cybersecurity firm and gave the world the first anti-virus program. “An event seldom changes our culture in ways that can be clearly seen, measured and felt. In the past 200 years, there have been two events. The first was The Industrial revolution. The second was the digital revolution. I think that the Blockchain will dwarf both.” While this is a very bold statement, it comes from one of the individuals that have been at the heart of the digital revolution. The blockchain’s potential as a disruptor is huge. It can transform every hierarchical power system into a distributed system. It’s a democratizing force; it changes things from vertical to horizontal through the power of mathematics and cryptography. It can get us very far indeed if we, as humans, become flexible enough to accept that change and leave behind our traditional power structures in favor of something that’s more efficient, powerful and decentralized. We will need to learn how to live and work in environments in which central authorities (or authorities of any kind) do not count all that much, but the benefits we could get from that are real, and they’re here already. This technology is morally neutral, as any piece of knowledge or technology usually is. Mr. McAffee is very clear in stating that it can be used for good or bad. It’s not the tech itself but how you handle it, he uses nuclear energy as an example, it can give you nuclear energy or nuclear bombs. One of Mr. McAffee’s most famous statements concerns Bitcoin’s future value. He’s predicted that every Bitcoin token will reach a value of $1 million by 2020. This has been very controversial, but there actually is a website that’s doing the math behind this prediction and tracking Bitcoin’s progress in order to find out if Mr. McAffee will be right. As of now, it just looks plausible. According to Bircoin.top (they have done the math behind Mr. McAffee’s prediction), if Bitcoin grows by 0.48% daily, they will hit the million dollar line by 2020 as per McAfee’s foresight. The thing is, this exactly more or less how Bitcoin has been behaving over the last months, so it’s just possible that McAffee’s prediction will indeed hit the target. Keep an eye on it; it might just become a reality in only eighteen months. Of course, there’s the opposite camp. The leading voice in opposition to cryptocurrencies (but not the blockchain technology) is JPMorgan’s CEO and chairman, Jamie Dimon. I think he’s wrong, but I will give you his point of view anyway. Mr. Dimon has been just as vocal as Mr. McAfee about his views on cryptocurrencies (especially Bitcoin) except he is utterly pessimistic and thinks it’s all about the hype, and they will never amount to anything. In fact, Mr. Dimon’s opinions about cryptocurrencies are so loud and harsh that they could be construed as positively violent. The strangest thing about this is that it comes from him, the CEO of a bank that everyday moves six trillion dollars around the world by means of the blockchain technology and digital currencies. That is not my opinion, Mr. Dimon has said that himself in several interviews. While Mr. Dimon likes and respects the blockchain technology, he believes in fiat currencies only. In his mind, digital currencies are worth nothing, and they’re going to be crushed by the world’s governments sooner or later. This seems paradoxical because it implies that Mr. Dimon, who should be an expert, doesn’t understand how fiat currencies work. Fiat currencies don’t have any value on themselves either. They are used in their countries because law mandates it but since Nixon dropped the gold standard there’s nothing supporting the USD or any other fiat currency, but for the government’s promise to pay back interest to the central bank (the Federal Reserve in the US case). So why is this not a problem for fiat currencies according to Mr. Dimon but it is for alt-coins? He even said that Bitcoin (and by implication all other digital coins) are just a fraud that will not end well. The irony in the situation is that Mr. Dimon says he couldn’t possibly care any less about Bitcoin in particular and digital currencies in general, but if this is so then why can’t he stop talking about them? You can have a look at his comment’s full vitriol at this page where there is a full transcript of Mr. Dimon’s remarks. I encourage you to go there, read the full text and make your own mind about this. Jamie Dimon has not been the first financial world celebrity to express skepticism about cryptocurrencies. People like Howard Marks, Warren Buffet, and Seth Klarman are also skeptics, but Mr. Dimon is not merely skeptic but sarcastic. I, as a crypto and blockchain enthusiast, believe that skepticism is ok, I like it. A healthy dose of skepticism makes you smarter and keeps you on your toes. We’re all for that. But I also believe that Mr. McAfee is on the right in this, and Mr. Dimon is not. I will give you the facts shortly but it all boils down to this: Mr. McAfee has done the math, knows what he’s talking about and he has a deep understanding of the blockchain technology, digital coins, and the digital world while Mr. Dimon is (should be) an expert on finances but is not that competent when it comes to digital technology, so he’s just talking about his personal and very subjective opinion about a topic he does not really understand. So, we have several reasons to line up with Mr. McAfee, and I’ll explain them to you. For a start, Mr. Dimon and other skeptics criticize crypto coins because they’re not a good retail product such as Visa or Paypal. And they’re right about that, but they’re missing the point. Cryptocoins have never been about becoming a retail currency but about providing the world with an offshore banking system that is fully democratic, decentralized, safe and reliable. In this regard, crypto coins could become some serious competition for JPMorgan sometime soon, which could help explain why Mr. Dimon attacks them so vehemently. Let’s now have a look at Mr. Dimon’s specific claims and arguments, because they are very easily debunked. He said about Bitcoin that “eventually, it will be closed.” This just shows he doesn’t understand the first thing about the blockchain technology. It’s just ridiculous, even laughable. There is no central authority for Bitcoin (which was the whole point from the beginning), and that means you can’t just shut it down. It runs on almost ten thousand nodes that are spread the world over. The only way to shut Bitcoin down would be to shut the whole internet down or for every government in the world to go against Bitcoin in a coordinated effort. This hasn’t happened to achieve world peace, or in the fight against global warming. You just can’t get most of the world’s governments to work together on anything, so Bitcoin will stay around. He also accused Bitcoin of being “a fraud.” As stated before, it’s not more of a fraud than any other fiat currency in the world today. We use them because of a convention, not because of intrinsic value. It’s true that some weird stuff goes on at times in the crypto world. There are speculations and shady dealings, but doesn’t that happen every bit as much with fiat currencies? No fiat currency has ever been used to deal under the table and finance crime and war? But in a system that’s so widely distributed around the world as Bitcoin is, fraud is just impossible. Every user keeps a full copy of the blockchain. Perpetrating a fraud would require a single powerful person to have his way with every Bitcoin user in the world, and that’s just impossible. Bitcoin was designed from the beginning to avoid that very problem. You cannot defraud the Bitcoin network just because you can’t control it. It’s as simple as that. Even Satoshi Nakamoto (he, or she, or they, at this point it’s more of a mythical character than a real person) couldn’t do it if he wanted. He can’t. Developers can’t. Miners can’t. Mr. Dimon also stated that Bitcoin is a better currency than fiat only in places like Ecuador, North Korea or Venezuela. I kind of agree with him on that. These are countries in which the local economy is such chaos that Bitcoin could actually improve their conditions if they adopted it. But these very examples also show why the fiat currencies are no silver bullet; they can fail as well, and then digital currencies could take things over and make things better for everybody, so Mr. Dimon’s own declaration ends up biting its own tail. So it’s Bitcoin ultimately going to succeed? We don’t really know; I can’t possibly tell at this point. But it has momentum going for it, it’s acquired value, it’s a reliable system, and you just can’t stop it. Listen to Mr. John McAfee. He understands the digital world; he understands the blockchain, and his predictions have been backed up by facts until now. So if we have to choose between Dimon’s and McAfee’s opinions, we have to go for McAfee’s. And so should you.